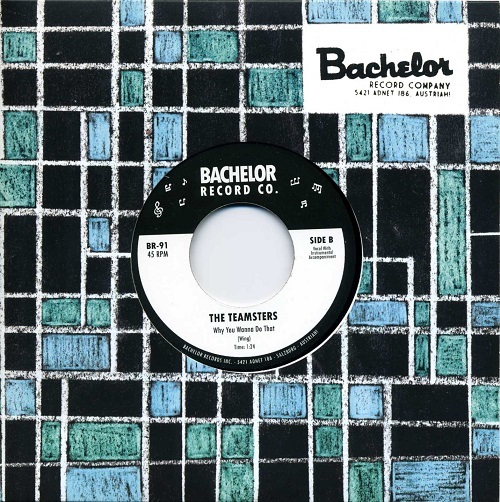 ​The Teamsters - Sharp Suited S.O.A.G. ! 02. Why You Wanna Do That? 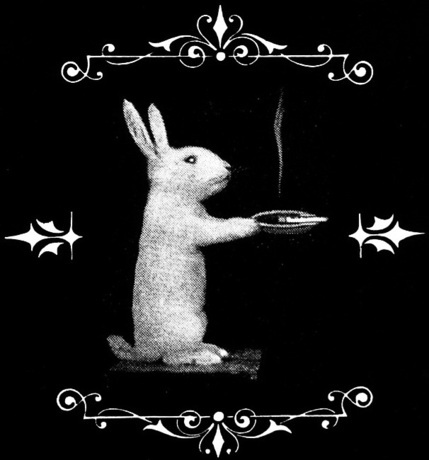 London beatsters The Teamsters have released a new single in full mono spectrum. It's the same Chuck Berry / Beatles / Milkshakes / Kaisers recipe of old, but with practice they've gotten better at it and if you haven't yet cottoned on... now is the time to! The Teamsters haven't released anything since September 2014, with the exception of a demo on a compilation tape released over in Chicago. Their line-up of drummers changed drastically over the last 18 months, with the likes of Bruce Brand stepping in before leaving in March of this year. That's not to say that the group haven't been recording and writing profusely, they never stop in fact. 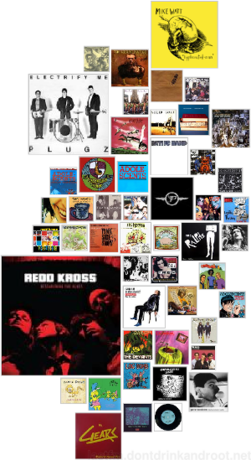 They declare that they enough for 2 LPs, but their refusal to compromise on the sound they strive for has left them re-recording and mixing dozens of tracks. Intent on making a truly great record. In the meantime they were happy enough to release a couple of tracks for a single on Bachelor Records. The songs are co written by the bands guitarist and bass player Tom and Dan, and we were happy enough to put them out. Look who’s back! 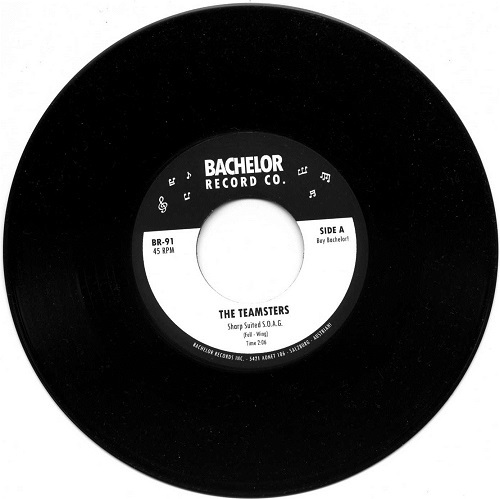 After their blazing start with the four-track EP Play Along With… The Teamsters followed it with the frenzied combo that is their self-titled album that same year (2014). Both were released under the Hamburger label Moody Monkey Records and a small demo on a compilation tape was later released in Chicago. The band has been rather quiet for over two years now, but no more! The North London rockers have just been reborn with an upbeat, rhythm and bluesy, 60s atmospheric single titled Sharp Suited S.O.A.G. We gladly welcome them back. Their current line-up consists of Tom H. Wing on guitar and lead vocals, Daniel Fell on bass, as well as guitar on ‘S.O.A.G.’ and co lead vocals, and Bruce Brand on drums and percussion, with Tom and Dan co writing Side-A. Like their other releases this too is limited to 500 copies. This time, however, it is under the Austrian label Bachelor; recorded by Jim Riley and Brendan Esmonde at Ranscombe Studios in Rochester, Kent. It is enveloped in a good old-fashioned cardboard sleeve with artwork made by Tom H. Wing. Your first impression might be, “here’s a simple beat single with simple beat songs, easy topics and easy to dance to.” Guess what? You are right, and that’s perfectly fine. Most of the time less is more and it’s definitely more difficult to achieve. Sharp Suited S.O.A.G. brings us a smile to our lips and a twinkle to our hips. ‘Son of a gun,’ aren’t they all? The suits? Sharp Suited S.O.A.G., the A-side from the new single is a parody about how ‘clothes’ (read ‘money’) supposedly make the man. ‘Nation’s favourite son’ – one of the many reasons why this world is fucked up as it is. When you hear the mockery wrapped up in such a cheery tune, filled with delightful irony, it just shows the absurdity of it all. What else can you do other than to laugh and dance this farce away? The B-side is your well-known love song type. Cutely structured, jovial and beautifully danceable. You know, those kinds of songs you search for when trying to answer your own questions without being too obvious. Just check Facebook, people do love their innuendos. After hearing them over and over, you jump right onto the dance floor as soon as the first note hits. Altogether, it’s great to hear these boys again and I’ve heard they have material for at least two more LPs. 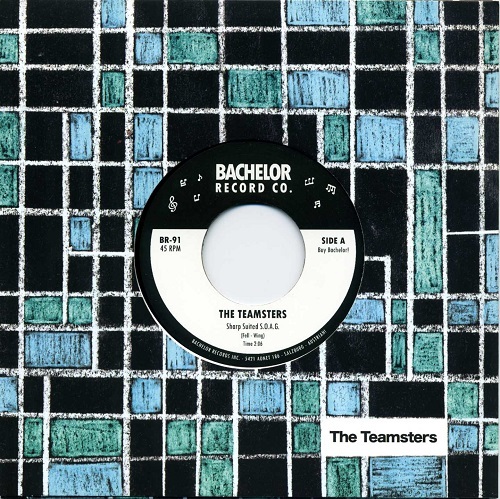 Voici donc le dernier single des Teamsters en date, et surtout, le dernier disque tout court! Effectivement, il semble que depuis le groupe ait splitté et que ses membres soient allés dans différentes directions. Tom H. Wing (guitare/chant) qui signe ici l'illustration du single, a depuis participé à un projet d'EP avec les danois dans le vent de The Youth. L'ironie faussement joviale du premier titre les aurait-elle rattrapé? Auraient-ils disparu dans le fog londonien? C'est donc le cœur brisé que le deuxième titre nous fera chanter, la larme à l’œil: "bébé pourquoi tu veux faire çà?" Same Rip specs as usual, now what's the reason you wanna do that ? !